An incredibly common problem I see is riders toes turning out. It's frustrating isn’t it; as you have a lovely ride and someone takes a picture and all seems well until you realise your feet are pointing at quarter to three! I also imagine over the years your instructor may have tried to turn your foot in causing you to yelp that it won’t go that way! There can be a few common reasons why riders feet turn out. One reason is tight abductors. The abductors are the muscles around your outer hip and bum. These are the muscles that turn your hip out -and therefore turn your foot out! When we sit on a horse these muscles which sit on the outside of our hip are put into a shortened position as our inner thighs (adductors) are lengthened to go around the horse. Due to this continual shortening they can become "over shortened" and unable to relax back down which then travels down the leg and rotates the whole thing. Another reason could be a spasm in the Piriformis muscle. The Piriformis is a muscle located deep in the glutes and is a hip rotator, so it’s very action is to turn the foot out. As with the abductors it can become tight and then hold the hip externally rotated-causing the duck feet effect. In both of these cases another issue that needs to be addressed is Hip Stability. If there is weakness in the abductor and glute muscles they will “latch on” to try and create stability. For this reason I always like to take two pronged approach to this issue. Step one. Release the muscle. Step two. Strengthen the muscle. We are of course going to start with releasing the muscle. In order to help the muscle relax and lengthen we need to release any impingement that may be present. Start with the Anti Spasm exercise for the Piriformis. Then try releasing the abductors and Piriformis with a ball or foam roller-personally I prefer a ball. Any ball will do such as a tennis ball, of a hockey ball or one of those spike physio balls I hand out all the time. For the Piriformis sit with the ball somewhere between your seat ball and your outer thigh-you’ll know when you’ve hit it! Roll around there, pressing and releasing until you feel the tension fade. For the abductors I find the traditional foam rolling technique too strong for most people so I suggest just hand rolling the ball down the outer thigh from the outside of the hip to the outside of the knee. We will have a look at hip stability next week. 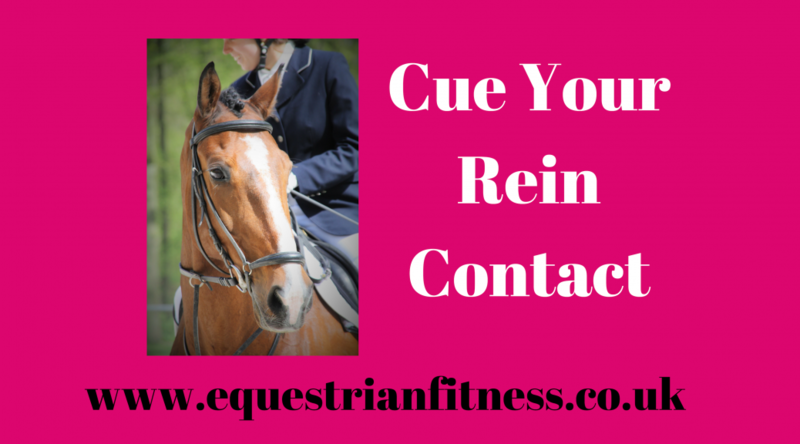 I work regularly with riders on how they can better activate their core whilst riding. It’s not that most riders don’t have great core stability they just struggle to activate it whilst riding. Often when asked to sit up tall we simply stretch up-often sticking our chests out (your headlights as I call them) and have then created admittedly a taller frame at the front but our abdominals are now in an elongated position and we will be shorter at the back. Then in order to try and stabilise riders will often lean back a little more as the horse moves forward creating a hollow back. In order for our core to work effectively we actually need to be equal in length at the back and at the front. This enables us to use our front and back equally and be able to truly stabilise and go with the movement of the horse. Essentially to create equal length front and back we need to close the front a little which in turn if done correctly will activate the muscles of the abdominals and hip flexors enabling them to work correctly. To find the right muscles and movement pattern before you get on your horse you can try this exercise on the floor. It’s like an ab crunch but with about 2/3 less movement. So I want you to lie on the floor, knees bent feet hip width apart. Your hands go behind your head-purely for support they do not pull on your head at all! Your elbows should also stay out to the sides throughout. You are going to recruit your abdominals and as you breathe out pull them back towards your spine. Do a few breaths like this first to get the hang of it, breathe in let your belly rise, breathe out, recruit and draw in towards your spine. You are trying to prevent your belly from popping up as you lift up. Now breathe in to prepare as your breathe out recruit the abdominals and send your bottom rib towards your hips, your shoulders lifting slightly as you do so-however the bottom of your shoulder blades should still be on the floor. Keep your eyes focused to the top corner of the room. Your belly should not pop up as you lift. If you feel this in your neck you are not recruiting your abdominals correctly and may need to focus on just the breathing pattern for a while until you master it. Once you can feel this recruitment pattern try recruiting bottom rib to hip whilst on your horse. This adjustment will appear really minor and you should remember to keep your shoulders open as the rib cage drops-otherwise you will be in the opposite problem of too hunched! Give this a go and let me know how it feels and if it helped! 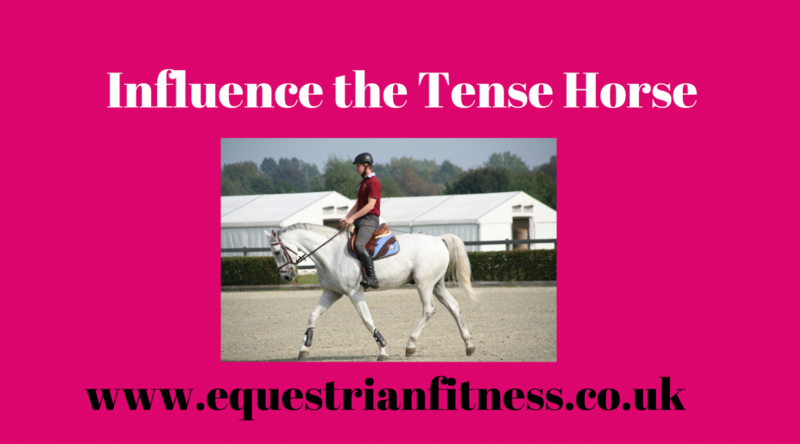 If you ride a tense of stressy horse it can be difficult to understand how you can influence him other than hanging on for the ride and pushing forward. However there are some things you can do with your own body that will help a little-or at least not make it worse! It seems obvious but it can be really tricky to actually do, but try it to hold tension in your own body. Start with your breathing. Breathing into your Diaphragm or belly breathing taps into your Vagus Nerve which creates relaxation in your own body that will transfer to your horse. It also encourages relaxation of your Psoas muscle that sits at the front of your hip, this will allow your seat and leg position to be more relaxed. Keeping your elbows closed into your sides encourages you to switch on your back muscles which will allow your arms and hands to relax down the reins. You will have a much more stable but relaxed contact if it comes from your back rather than your arms. Before you get on rolling your glutes on a small ball can release tension in your seat, and of course some general movements such as arms swings or fig 8s, leg swings, squats and lunges can encourage muscles to switch on and work more efficiently rather than bracing under tension. If all else fails have a little sing song as it will help you do the above without even realising! I’d avoid any Mariah Carey high notes though……..
Last week I attended a course by Andy Thomas, who is the physio for many of the top level Equestrians including the British and American teams. We discussed pre ride warm ups. Of course it is common place to warm your horse up at the beginning of every ride, but what about yourself? I rarely see riders do anything to prepare themselves for the schooling session, Dressage test etc. With any other sport athletes perform a warm up before they start. The purpose is to prepare the body for the work you are about to ask it to do. For riding I also think it is important to realign the body before you start as hours spent hunched over desks, driving or doing yard work are not conducive to a good riding position. So how should you warm up to ride? Firstly we need to switch on the muscles we are about to use, and in some circumstances release any that are “hypertonic “ or “over tight” as I explain it to clients. Which muscles are you going to use? The short answer is of course all of them but most importantly the legs and glutes, the core/back muscles. I find it also helpful to switch on my stabiliser muscles by doing some balance work. I know this sounds like a lot of things to do and perhaps like something that involves needing a gym or equipment before you’ve even got on your horse. That is absolutely not the case, in just 2-4 moves for just a couple of minutes before you get on I promise will make the world of difference to your ride. I’ve done a couple of routines that you can try out, either separately or altogether depending on how you feel. I have used Dumb Waiters to switch on my back muscles, reverse lunges to a standing balance to switch on legs, glutes and the stabilisers. In another I have used press ups on a mounting block to switch on the back/core and crab walks for legs, glutes and hip stabilisers. When you embark on an “improve your riding” project it can all feel like an impossible task. There are so many things to remember and then do all at once, whilst on top of a moving animal! Whenever you are trying to master something give yourself just 2-3 cues max-even just 1 if you are really struggling. That way you can just focus on the most important elements, nail those and then tidy it up later. As an example I spent some time essentially re-learning my rising trot mechanism in order to be able to influence the horse more with my body. Thats 7 cues there and to be honest there were probably more! Instead of trying to do all of those new things at once I focused on the ones that would make the most immediate impact. This was more than enough to be getting on with and they were all in linked areas so it was essentially re-aliging my pelvis as a starting point. Once I had got those pretty much there, I added in stabilising the lower leg and then looking straight ahead. It is only now that these are “almost” second nature that I have started to focus on my elbows and shoulders. Now this seems like a long process, but on the other hand if I had just tried to change everything all at once I would have found it too difficult and probably given up-so I would not have imrpved my rising trot at all. However this way, I have been continually month by month, ride by ride been slowly making changes and improving my trot. What do you want to improve in your riding? Break down the things that you need to focus on to improve and then just pick no more than 3 from that list to start with. Imagine how much you could have improved in 1,2,3 and 6 months from now;my rising trot looks like a different rider! I see loads of posts these days about riders needing to stretch their hips, I also have lots of ladies tell me that their instructor told them to stretch their hips as they were too tight and this is why they couldn’t sit to the trot, couldn’t move with the horse in Canter, where gripping with their thighs etc. The thing is I’ve done lots of Biomechanics, Flexibility and Stability tests on various different riders and almost all of them have passed the flexibility test for hips. 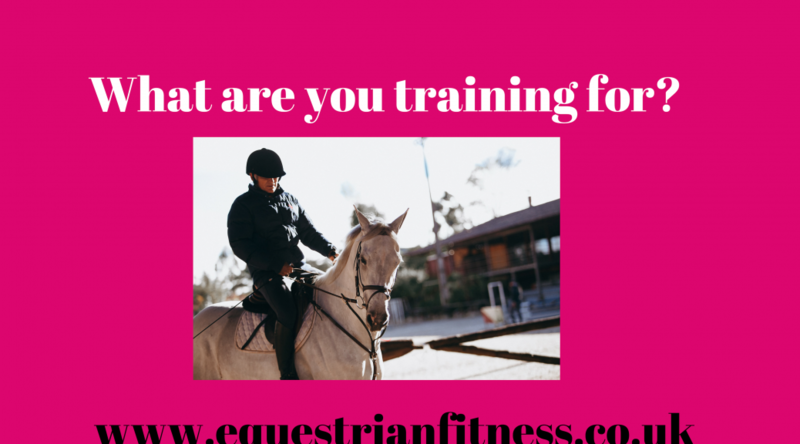 Think about it, just sitting astride a horse stretches out your inner thigh a great deal, then the position of your leg will stretch out the front of your thigh-even more so if you ride in a Dressage Saddle. This information sat in my brain for a while at the beginning of my journey training riders and I would do what everyone else did and stretch out riders hips (including my own) and see if it made a difference. I’ll be honest it usually felt a little looser but it didn’t actually fix the problem of my seat, legs, gripping etc. Then further along my journey I started adding in Stability testing, and you know what? 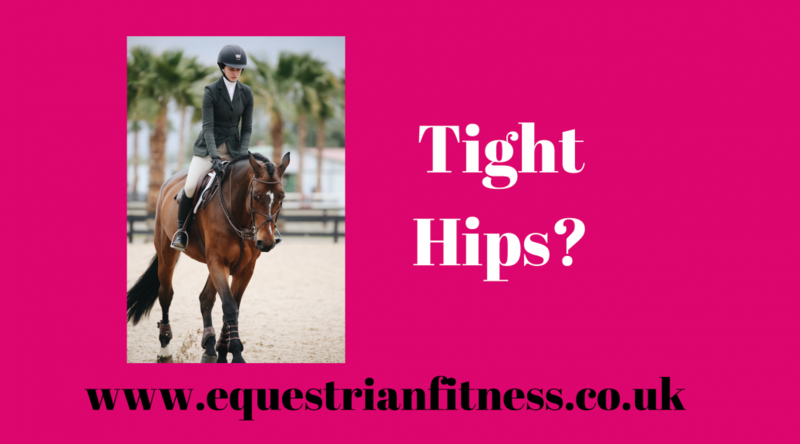 All those riders that claimed their hips were too tight when riding despite having more than adequate flexibility when tested……………..they failed the hip stability test! So, how does this match up to the feeling of having “tight” hips? Movement Specialist Gray Cook describes Stability as “The ability to demonstrate Flexibility under load” In this case the ability to remain flexible whilst absorbing the movement of half a ton of horse underneath you.Boom! That explained everything. The reason many riders appear flexible when tested on a table is that they do have the necessary range of movement, however the minute they are put on a moving horse the hips are not strong enough to absorb all of that movement whilst in a lengthened state so they contract and shorten to make themselves more stable. 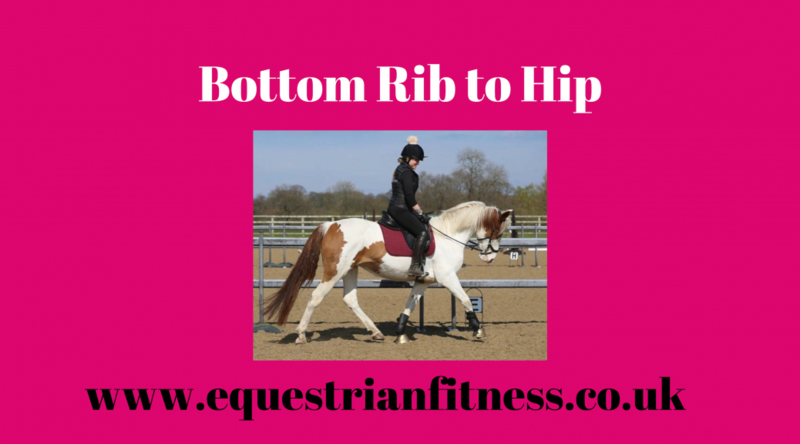 The rider then stretches the hips and of course it feels nice as the hips have been shortened for a time and do need lengthening back out, but this stretching does not cure the initial problem and the rider continues to struggle. This lack of flexibility under load is just the bodies protective mechanism, basically it doesn’t trust you to be strong and flexible at the same time. 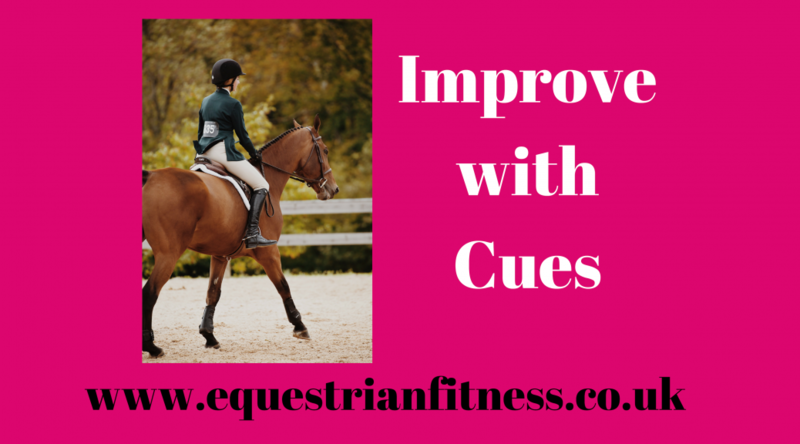 So, if this sounds familiar; your hips feel tight, you struggle to ride in neutral spine and get your leg long down your horses side or your instructor says you are gripping or not moving with your horse and so far stretching hasn’t fixed your problem other than feel quite nice at the time it’s time to change tactics. I am huge on hip stability with my riders, we do loads of it in my classes -like every week! What can you do to improve yours? Thinks like Glute Bridges, Single Leg Glute Bridges, Split Squats and Single Leg Deadlifts are all great hip stability exercises so why not give them a try and they might just help you deal with that “tight hips” problem. 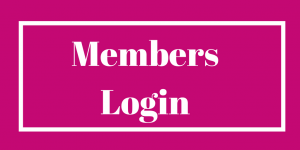 I’m sure you will have noticed that rider fitness is gaining momentum. More research is being done into the effects of rider symmetry on the horse, as well as rider weight and I’m sure more and more will continue to be done. It is also now common place for the top riders in many countries to have team physios and fitness trainers. As perhaps an amateur rider you may be thinking this isn’t really relevant to you, especially if you don’t compete. 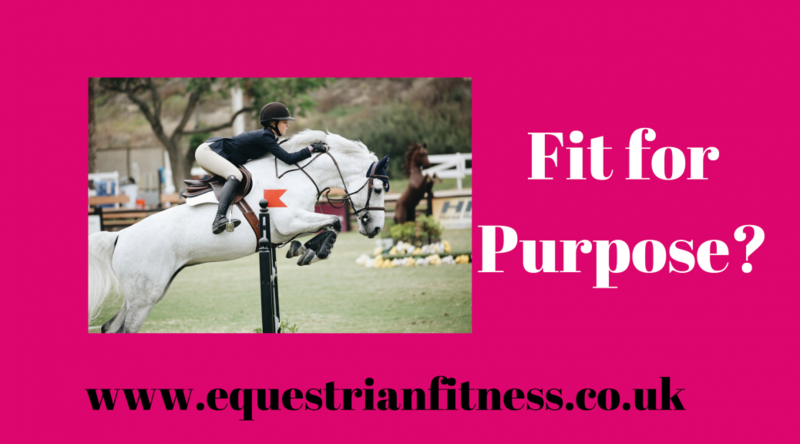 However being fit to ride applies to every rider. Firstly for the aforementioned research projects that have shown that rider symmetry and weight has a correlation with horse lameness. Secondly though being “fit for purpose” as it were will prevent you becoming injured and developing the general aches and pains I see lots of riders deal with. You see, being strong, flexible and with a decent level of endurance makes everyday tasks become that little bit easier -carrying a bag of feed no problem! So when something happens like that crazy catapult jump your horse threw in during your lesson your body is better equipped to deal with it. It’s not already knackered from the mucking out you do so it’s still got some extra left in the tank to help you out. It also makes the demand of just riding easier on your body. If from top to toe you are mobile, stable and balanced there will be less chance of compensatory actions happening and the wrong muscles being over worked whilst others are not working at all. I think one of the most visual examples I see of body compensation is Dressage Riders (sorry guys). How often do you see someone going into a “big trot” and lean back as they do it? This is under the impression that it makes them feel more stable and better able to ride that trot. What it is actually doing is stretching out the front of the abs and therefore not recruiting them properly and putting all the work into the lower back now into a very short contracted position. Strangely enough many of these riders will complain of back pain………Basically neither front nor back is doing its best work. Also as a side note they are also behind the movement because they are no longer over the centre of the horse so it’s a lose lose situation. Unfortunately if these riders then try to sit up with equal front and back and sit to the trot they will find it wobbly and will struggle to ride it. This is because they need to re learn the muscle balance and be able to work the front and back equally. 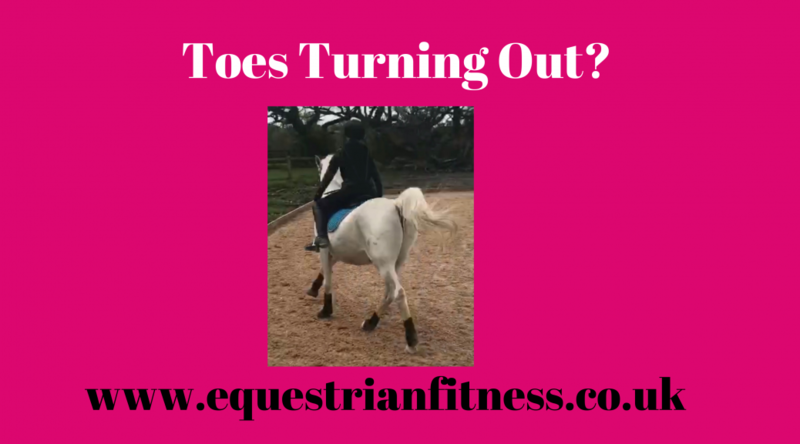 This takes time and effort but if they do it not only will they get less back pain but they’ll also find they have way more riding to give that trot-which then transfers to more complicated movements such as changes, pirouettes etc. It’s not just the Dressage riders that are guilty of this, that was just a very common visual I think you will be able to identify with. I also see lots of Showjumpers doing the reverse and over rounding at the shoulders both before and over fences, plenty of hackers slouched etc. Let’s be honest we are all guilty of falling into bad habits. So, next time you are riding have a think about your position. Is it level at the front and back so you can use both sides equally? Of course then ask yourself if you are level left to right so you know you are less likely to be crooked. If you find yourself lacking in some areas…...well you could come and work with me and we can iron those issues out! Conor Mcgregor said in an interview “precision beats strength “ Obviously he was referring to MMA fighting but I think this definitely holds true for riders. If you are quite strong then it is easy to give a really strong leg aid, but for that leg aid to be effective needs to be given and the right time and place. The same goes for any aid given when riding. A strong aid is great but it needs to be clear for it to get through. We work on this in my classes, it’s called Proprioception or as Equipilates™️ Founder Lindsay Wilcox-Reid calls it “Equiception”. So what is this mythical thing we’re after? Proprioception is knowing where your body is in space, so Equiception is knowing exactly what your right leg or left hand are doing, what’s that right seat bone up to and where is your rib cage. It’s essentially body awareness and I think it is a huge part of good riding. These are the things that all add up to clear aids and they are part of the elusive almost invisible aids of the top riders. We’ve never seen Charlotte give a pony club kick to get her Canter have we? Although it would give us all a giggle I’m sure! A simple look at this is perhaps giving an aid with the leg ON the girth….do you know when you’ve definitely got that right? Or inside leg outside hand at EXACTLY the same time-this is way harder than you think. So, how do you train body awareness? I could say well “come to a class and find out…..” but I’m not that mean. The truth is we train it in lots of different ways. One of my favourites is through Yoga Flows; linking balance, movement and rotation to train your brain to be able to control parts of your body you can’t currently see with your eyes-in short if you don’t do it right you’ll fall over-tough love! We also train it through work with props such as small balls for leg aids, bands for rein aids and on unstable surfaces such as gym balls and wobble boards-again you fall off if it’s not right! It can be as simple as performing a move to and either asking a friend to watch or videoing yourself-something like a Superman is a nice , easy start. Do you move both the arm and leg at Exactly the same time? Are you aware if you do or don’t? What does your middle do when you move? Does it stay still or does it dip? Can you feel it doing it? Noticing is the first step to correction as you cannot correct what you can’t feel. Have a go and let me know how you get on? The last couple of weeks my 1 2 1 Clients and the ladies in my classes have all been starting to think about upping their game and take on the 2019 season. They have different goals in mind so different approaches to what they need to do to really smash it this year. I have those who are already seasoned competitors looking to go up a level this year so their fitness is about fine tuning their muscles to be just that little bit stronger, to be that little bit more aware of what is happening from head to foot when they ride and how to control it a little bit better. I have no doubt that this fine tuning will actually see some great results for them this year. This means we work on any weaknesses and asymmetry, focus on the mind body connection and aim to be moving a little bit better, with a little more strength but an entire fitness overhaul isn’t needed it’s just a an hour or so a week to tweak those muscles. I also have another little club of riders who have recently purchased bigger, more powerful horses that in reality they are going to have to learn to ride! That’s not to say they can’t ride already, they ride exceptionally well in fact but they have spent the last few years on a horse they are comfortable with and that perhaps isn’t quite as powerful as what they are about to let themselves in for! ( I think these ladies like a challenge!) In short these ladies are going to have to up their game massively and become an athlete; strong and stable enough to absorb all of that power and damn well Ride it! If you’re one of these…….then if you aren’t already pretty fit then you had better get started. To ride the equine equivalent of a Ferrari (it doesn’t have to be Valegro just your version of a Ferrari-mines 13H!) you need to have the body control to absorb all that power without injuring yourself. I see a lot of back and hip pain in riders just because they are actually not strong enough through their back, hips and core to hold that horse together. I’m sure you’ve all also seen someone being an untidy passenger on a powerful horse and it’s frustrating when you can see the potential if the rider worked on themselves. Once you can hold it together you then need to have the body control and awareness to make the finite aids that make you really dance. 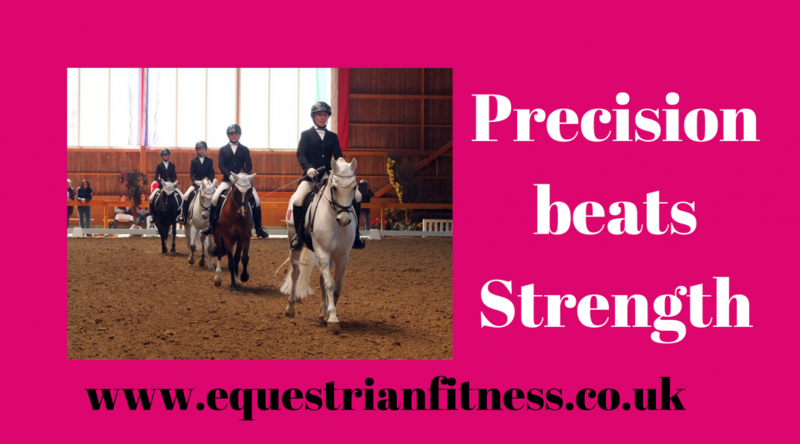 I’m sure you know that to make riding look effortless in fact takes a huge amount of effort! I hate to be the bearer of bad news if this is you but unless you’re already strong and fit and in the fine tuning camp it’s going to be a couple of hours per week dedication that gets you really riding like the sassy diva you are..
Then I have the other camp that for various reasons aren’t riding at the minute. For those that it’s due to horse problems it’s about staying in the game so when you’re finally back on board it isn’t a huge shock to your body but also that they are in the best shape they can be to give their horse all the support it needs to get back to fitness or if it will be a new horse so that they aren’t transferring bad habits. There is something slightly terrifying about having a newly backed youngster knowing that if it becomes one sided it was you that did it…….What are we doing-similar to the fine tuning camp, just ticking over ironing out the imbalances and keeping ship shape for when we are back on board. If it is because of their own health and fitness problems then it is of course about getting them fit enough to get back on board and doing the sport they love. 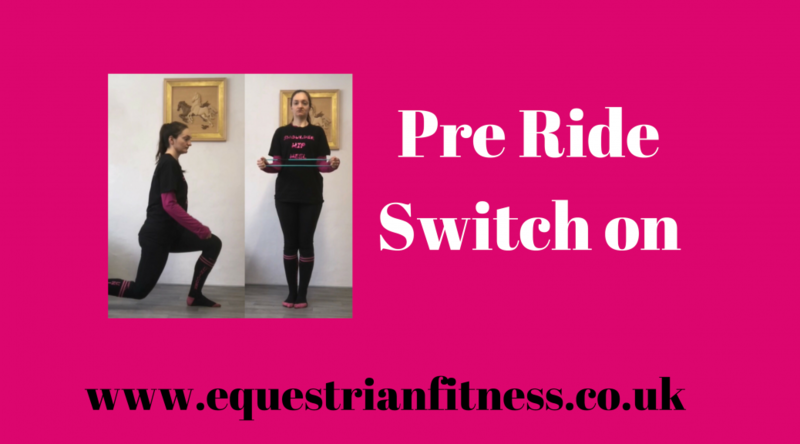 With these riders it’s slow and steady, but regular movement to bring back those basic movement patterns that eventually will make them able to put that foot back in the stirrup. What camp do you fall in to? Maybe one of these categories of perhaps something else?